Sorry I haven't posted anything in a while. I have had some Typepad issues. I am hoping it is fixed now. My Blog was showing no color design and no columns. So I just want to post something and I thought you would enjoy these wonderful flowers. Patty B always share her beautiful roses and flowers. I enjoy them so much. So these flowers are giant Hibiscus. I love these flowers. Everyone who sees them can't believe how big they are. 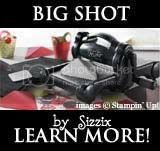 I put a Stampin Up stamp pad just so you could see how really big they really are. Ok this great necklace was made by Susan Romito. It is wonderful. She used a large washer, yep! like the one out in the garage. Put 2 different rub -ons, ( a white, then a black on top of it) and a rhinestone brad. Clever!!! What a fun idea. Ladies we will make these at one of our Stamp Club months. Ok are you ready? 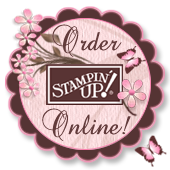 Starting July 1st Stampin Up is offering a whole new line of Product. It is call "decor elements". We are all so excite about this news. Now you can personalize your surroundings with a variety of exclusive designed to create a customized unique space. The best part about these are they a removable. So you can decorate any Room, window, shower doors, front door, Just about any surface except that is unevan or really rough. I bought one which I will post as soon as I get time to hang it up. Click the link and take a peek. Let me know if you would like your own copy. Check make I here there is more to come. Here is a picture of our books recovered with Stampin Up Designer Paper and ribbon. The front cover I printed on vellum and used our fine glitter. 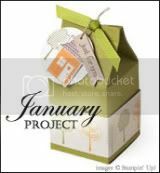 We made 38 differant way to use punches, ribbon, brads, card stock,stamps, ink and designer papers. We will add to them as new puches and ideas arise. The girls just loved making them. I thought this is a good way to remember things when you go to scrap of make cards. I hope you like this little book of ideas. Here is a sneak peek of my June stamp club project. One of my friends was making a scrapbook for a gift. She came over to barrow some of my punches. She asked me what are different ways to use punches. I pulled out my book of ideas that I made for my self,so I wouldn't forget ideas either that I seen on other blogs, or I had used on other projects. 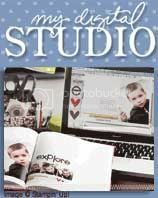 Paula said," I would love to take a class to make my own book" So I learned a lesson remember to LISTEN to your customers. So I started thinking do we make the book or do I buy a book, or do I ask them to bring their own book. Well a few days later I just happened to be at Target and that wonderful Dollar Spot. I seen these books happened to be .50 cents. on sale, My head was full of ideas. Check back 4-9-08 and see what we created.